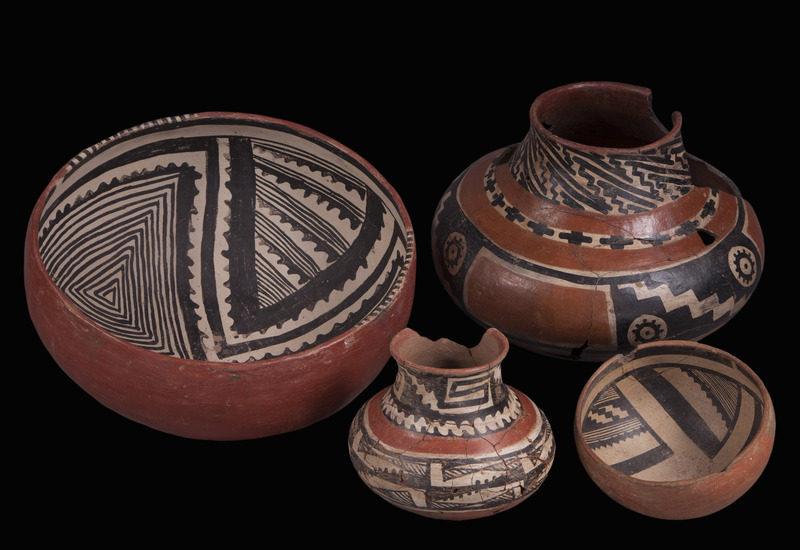 Salado Polychrome vessels. Click the image to open the Roosevelt Red Ware gallery. 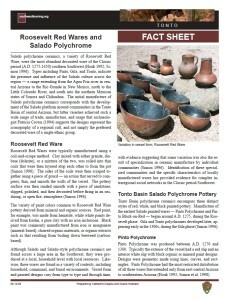 Roosevelt Red Ware, also known as Salado Red Ware or Salado Polychrome, is a pottery ware that was widespread throughout the Southwest during the late 13th century and well into the 15th century. 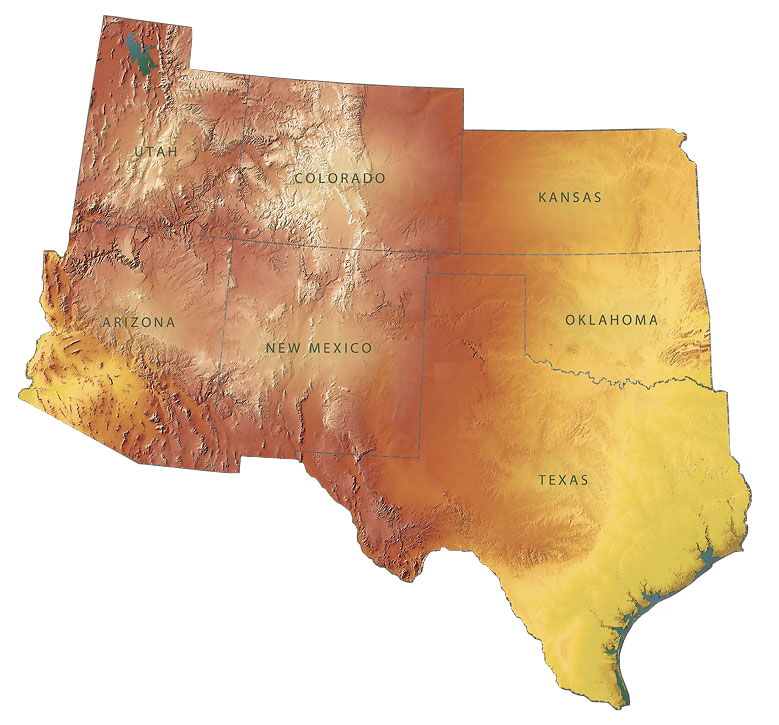 Concentrated in the Roosevelt Basin, Gila Basin, Verde Valley, San Pedro Valley, and in the vicinities of Globe and Safford, Arizona, this ware has been found as far afield as Flagstaff, Winslow, Ajo, Gila Bend, and Nogales, Arizona; El Paso, Texas; and Casas Grandes, Mexico. Types include: Cliff Polychrome, Cliff White-on-red, Dinwiddie Polychrome, Gila Polychrome, Los Muertos Polychrome, Ninemile Polychrome, Pinto Polychrome, Phoenix Polychrome, Salado Red, Salado Red-on-white, Tonto Polychrome, and Whiteriver Polychrome. Surface Finish: Smoothed, not highly polished; slipped; generally gritty; sometimes crazed; sometimes interior of bowls smudged. Surface Color: Red; sometimes white, in part. Vessel Thickness: 3.9 to 7.1 mm, average 5.5 mm (bowls); 4.0 to 7.4 mm, average 6 mm (jars). Paint: Black, red, and white. Pigments: Carbon, hematite, and kaolin; organic paint is more common for black. Design: The interior surface of all bowls are white; geometric decorations, bold and free; decorative styles unnamed; solid or hachured stripes, steps, Keys, squares, triangles, scrolls with scalloped or serrated edges. Neuzil, Anna, and Patrick Lyons. (2005) An Analysis of Whole Vessels from the Mills Collection Curated at Eastern Arizona College, Thatcher, Arizona. Center for Desert Archaeology Technical Report 2005-001. Tucson.